If you’re lucky enough to have Android 5.0 Lollipop on your phone or tablet, you might be wondering where to find silent mode, which turns off notification sounds and vibrations but keeps critical alerts, like alarms, on and active. It’s still there, but it’s under a different name. In the latest version of Android, Google has made a few sound control choices that are ultimately more elegant, but might cause confusion to longtime Android users. There’s evidence that [company]Google[/company] regards the new way that sounds are handled in Android Lollipop as a feature, not a bug where Google simply forgot to include a silent mode. 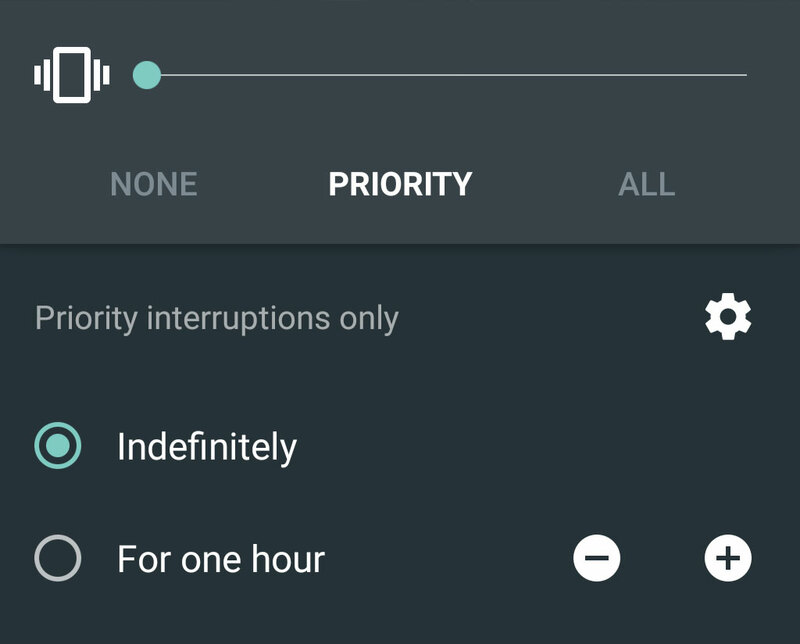 Basically, you’ve now got three options for quieting your phone: None, Priority and All. The difference is that the None setting is no sounds at all — handy for doctors or other people who might want to keep their device on but completely silent. You won’t receive vibrations, sounds, or a flashing LED light. 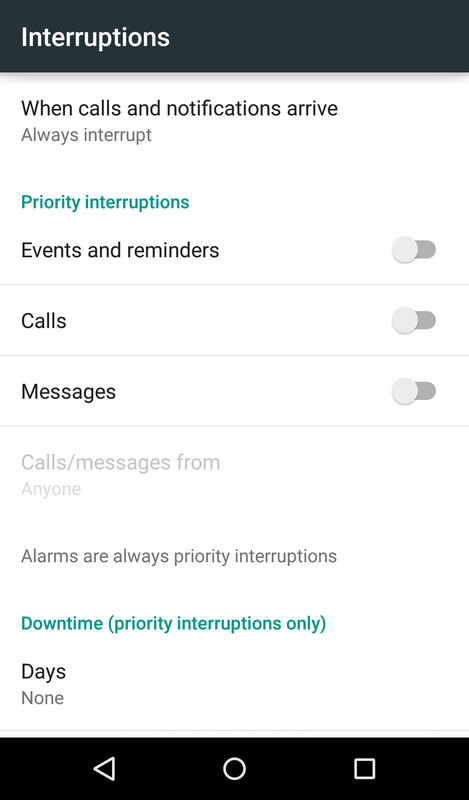 Priority is the old silent mode that silences almost everything except alarms and certain calls and texts you let through. All notifications is well, all notifications. You can activate the various settings by pressing the volume rocker on your handset. None and Priority modes will now also give you a timed option — so if you want to turn off all sounds but might forget to turn them back on, you can simply set a timer for a few hours. Still, there’s a little bit of configuration needed to get your notification sounds working the way they used to. Priority mode means your device will still beep or vibrate with notifications you deem “priority,” so you’ll need to curtail those. When you set your device to priority mode, simply click on the gear icon to access settings. To turn your phone on vibrate, turn the volume down to zero. A handy shortcut is to tap the bell icon in the top left corner of the volume pop-up, which will turn on vibrate (or revert back to your previous volume.) (Thanks, motostamp!) Unfortunately, long-pressing the power button no longer has vibrate or silent settings. If you find the new Google settings limiting, there are a number of third-party apps that can help. But be careful — many of them don’t work with the new ART runtime in Android Lollipop, so you might have to revert to the old Dalvik runtime or wait until the apps are updated. One app called Silence integrates well with automation workflows like Tasker, so you could conceivably automatically silence your phone when you walk into your office, for instance. If your phone has a built-in LED notificaitons light — the new Nexus 6 doesn’t, for instance — some on Reddit swear by Light Manager for visual notification configuration. Installed Lollipop last night on my LG G3. Only change to the device that i could see was “Do not disturb mode”. Thought that was odd but just assumed it was Silent mode with a silly new name. Set my alarm for 7am. Went to bed. Rolled over and woke up “gosh, its bright outside…8:20am!!!!”. Got to work in a panic. What a stupid, stupid change. 1. No noises. No phonecall sounds, no app alert noises, no text alert noises. 3. LED lights and the screen to light up when I receive a message or call, so if i’m looking at the phone i can see i’ve had a notification but the noise/vibration doesn’t annoy others at work/in public places. 4. My alarm to go off and make a noise (not a vibration) in the morning. Also, i’m not sure what “block notifications” as it’s not explained on the phone. Will it stop showing me that i’ve received a text or something? So i would have to go through my apps one by one and check if i have a message. I don’t want that. How about putting it in airplane mode? I am guessing you get mails and other notices from online services. Calendar reminders etc would still sound, as would your alarm. I used to have a sleep app (Sleep as Android) that could do this automatically, but in Android 4.4 you can’t set Airplane mode other than from the UI. I use priority notifications with Calls/Messages Off but I still receive text messages. This is a big problem. My default messenger app is Textra. Can tell me how to someone fix this? The problem with this, is that a person cannot make their phone completely silent. In priority mode, the phone still vibrates. I use my phone as an alarm to wake up in the morning, and in order to have the alarm on, it will still vibrate. In addition to this, I have found that even in priority mode with all settings set up correctly, some apps still give me notification sounds. 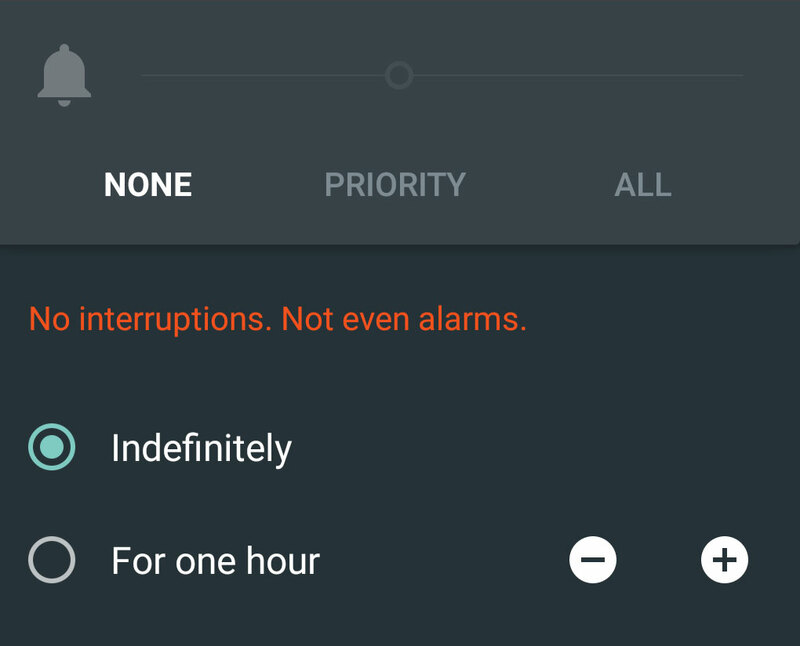 This is despite the settings being such that only the alarm should have priority. Test it before you post it – this doesnt work. Worst new “feature” on Android. Because apparently the simple method of using the volume button to control volume was too difficult for everyone. Sheesh even the things that work fine have to be tweaked. I expect more from Google. It feels like this feature skipped the UX team, and went from engineering to market. They could have added all these new fancy features, without making it so confusing to new and long time users. Don’t force a user to setup “priority interruptions”. Neither of these words make sense to a user who is trying to stop their phone from vibrating every time they get a message. long-pressing the power button was a really nice feature to access the vibra setting. Hi, I do not want the phone to ring or vibrate at all when there is a incoming call. I have the volume all the way turned down but when I do the vibrate icon pops up automatically. In settings I have it toggled off where it says ‘Also Vibrate For Calls’ Long pushing the volume no longer makes the phone silent with no vibrate or sound. How do you make it so there is no vibrate or sound for incoming calls? Thanks for any help someone is able to give me! To use silent mode all that you have to do is select priority mode, which shows up when you fiddle with the volume rocker. You even get a settings link next to it. You can go in the settings if you’ve never gone before from the main settings or if you want to change something. By default ‘events and reminders’ are switched on, which means that for these the phone will ring and vibrate (depending on your general settings) and for everything else the phone will be silent. Now this is where you get a lot of options which is confusing people. You have the option of calls and messages also in this mode and then further have the option of receiving calls/messages from anyone, contacts or starred contacts. Apart from this you also have the option of placing individual app’s notifications in the priority mode. See basically priority mode is silent mode but in Lollipop you have the option of selecting certain apps and contacts from which you can still recieve notifications (ring and vibrate or whatever your general settings are). For e.g., I want to silence my phone but still don’t want to miss out on my WhatsApp messages. So I can put WhatsApp in my priority list and then go into priority mode. So if there’s any call or message or anything else, my phone will not buzz but if any WhatsApp message comes then it will. So effectively Google has given more customisation for notifying in Lollipop. But it’s all done in a complex way and without any info about it. That’s where they went wrong. Their intent wasn’t! I just upgraded to 5.0 Lollipop on my Nexus 5 and i can’t sleep at night. I just want my alarm to work without anything else. Put the Priority mode and all message, calls off but for some reason i still get Whatapp notification message. IT IS SO frustrating that I can’t have my ALARM to work only without anything else. The NONE mode does not allow alarms So i have use my old alarm to wake up in the morning. Called google support and they still have no idea how fix this problem. It shocks me they would release a software and they give you no support for it. Basically the guy said i will forward this issue to the Lollipop software guys. Amy suggestions from anyone on how to silence my phone but keep the alarm to work ? I went through and set all of my ringtones/ notification sounds to “none” (while my ring volume is set to a volume). The downside is that if I want my phone to sound, I will have to go through and change all these settings again, but at least the LED light still flashes when I receive a text. Priority is not “the old silent mode” as it does not light the beacon. What a fail, this phone is like an iphone now. why sometime it doesn’t work and i have to turn the phone off and on!!!! Sorry, but it isn’t a feature: it’s a mistake. Now, we have to go to three different places for airplane mode, silence/vibrate, and power off, instead of just one. That is NOT an improvement. DOES NOT DESCRIBE HOW TO BRING UP THE OPTION MENU DISPLAYED IN THE POST!!!!! DOES NOT DESCRIBE WHERE THE OPTION WENT TO THAT WHEN I PRESS THE POWER BUTTON ON THE PHONE IT BROUGHT UP THE MENU AND ALLOWED ME TO SELECT SILENCE OR RING – THIS NO LONGER WORKS!!!!! You press the volume rockers. They’re on the side of yoru device. When I press my volume rocker from my home screen, sometimes I get app volume, and sometimes I get ringer volume. I had this same problem in KitKat. If I throw it in silent to play a game for example, when I come out of the came and try to set it back to vibrate, I’ve got to hit the rocker, I get the app volume, wait for it to disappear, try again, and again, and again, and then eventually, seemingly randomly, I’ll eventually get the ringer volume setting … flipping screens seems to have no effect … long-press does nothing, and as was already stated in the article, long-press of power only gives the option to “power off”. Not impressed. Anyone else having this issue and know a solution? I use an app called power toggles and what it does is give you control over the different volumes independently, from there you can silent the notification volume but leave the ringer volume at the previous state or viceversa, hope this works for you. I too was having the same problem. I long pressed on a blank spot on my home screen, is if I was accessing the wallpapers and widgets, and tried the volume rocker and finally was able to access the ringer control and not just the media control. I wasn’t even randomly getting ringer control, only media control so it’s nice to have found (what appears to be) a permanent solution. I doubt the “Silence” app will be of benefit, since they say it (currently) specifically does not work with anything later than 4.4 precisely because of all the changes Google have made. Can’t adjust notification while music is playing as volume controls only music output. This still doesn’t fix the old Silent mode. For example – at work all day i cannot have my phone making noise, including vibrating. However I can have the screen waking when i get notifications. This is now impossible. You set it to none and no screen wakes. Set it to priority and let messages through and it will wake, but also either vibrate or ring. There is no waking the screen while making no noise like there was on KitKat. These solutions do not understand the initial complaints at all. Agreed. This is like an iPhone now — you have to constantly turn the screen on to check for notifications. The way it handles them is piss poor, as well. Much more like iPhone and less like Blackberry as in the old OS. I miss the blinking beacon+nondescript identifier on top, meaning you had a text message, for example. Now you get either a loud intrusion, or nothing — no beacon, etc, then when you wake the phone up, you get your business shown, or “content hidden” which is strange. Very iphone like. They’ve engineered out what made this phone great; I also find it very strange and borderline insulting that you can’t just silence your damn phone. I don’t want to use their features. Android Lollipop is a mess on so many levels. Lollipop is to Android what Vista was to Microsoft. The biggest issue, in my opinion, will be to corporate Exchange users who are now being forced to Gmail or use a third party email client. Why does Google try to fix things that aren’t broken? There is something wrong when you need this much instruction just to silence your phone. Yeah seems that User Experience has done a step back in Lollipop. KitKat was perfect and efficient in many ways. This is not a good solution. The LED notification is disabled in Priority Mode. That means that I can no longer keep my phone silent and still have the LED flash. This is something I could do on KitKat. Also, by utilitizing Priority Mode as you mentioned in the article to replicate the old Silent Mode, I cannot use Priority Mode as a way to let only a few people call through. I want to be able to quickly switch between silent mode (with alarms), priority mode (allowing some callers), and normal mode with all sounds. Google can fix this by bringing back the silent mode. Found a way to quickly toggle vibrate – touch the bell icon after you bring up the menu via the volume rocker. NICE FIND. Thank you so much. Helpful article. Thanks. Had upgrade today… anyone know why 4g symbol no longer appears with mobile signal bar? Is there a setting? Whats an Android lollipop and do I need one?